Fancy a spot of tea? 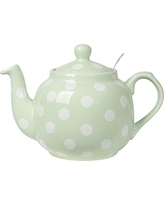 The classic shape, stylish mint color and polka-dot design make this quart-size teapot “spot on” wherever you pour tea. Its rounded body, dripless spout and cool, comfortable handle help you brew the perfect cuppa. Removable stainless steel strainer ensures easy clean up of loose tea and tea bags.